A 250-pound chunk of an airplane wing that is believed to be part of a 9/11 jetliner was hoisted out of an alley near the World Trade Center on Wednesday where it was found last week and taken into police custody. A dozen police officers worked for two hours using ropes and a hoist to lift the 5-foot-long piece of debris from the 18-inch-wide alley. They then wheeled it onto the street and loaded it into a pickup truck to take it to the NYPD property clerk's office in Brooklyn. Deputy Chief William Aubrey said the National September 11 Memorial & Museum could eventually take possession of the part. He described the removal as eerie and emotional. 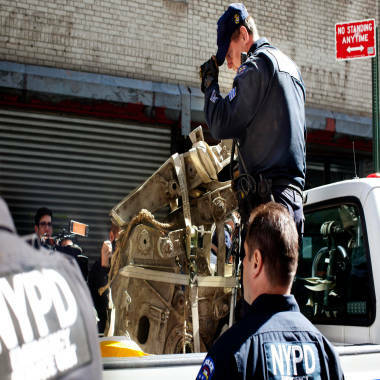 New York Police remove a piece of plane believed to be connected to the 9/11 terrorist attacks from an alley in downtown Manhattan. "It's a piece of history," he said. "We tried to preserve it as best we could." The part was removed after forensic authorities sifted the soil around it for human remains on Tuesday. The medical examiner's office said no potential human remains were found. The airplane debris, identified as a piece of a 767 wing, was found wedged in the alley last week by surveyors hired by the property owner, as first reported by NBC 4 New York. The alley is between the rear of 50 Murray St. and back of 51 Park Place, the site where a mosque and community center has been proposed three blocks from Ground Zero. Police say they have not determined whether the part came from American Airlines flight 11, which hit the north tower at 8:46 a.m., or United flight 175, which hit the south tower at 9:03 a.m. All of the other plane parts found in the immediate area were from flight 175.